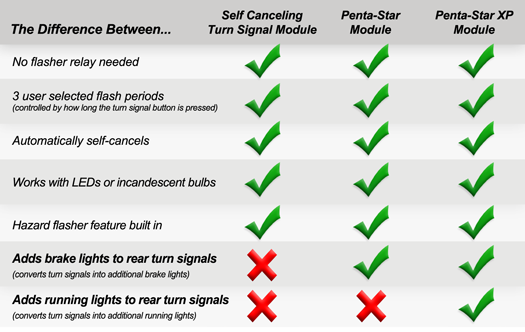 The Penta-Star™ XP Module combines the best of both worlds: Our Self Canceling Turn Signal Module™ and our Tri-Star™ XP Module! The Penta-Star™ XP Module is a self contained electronic flashing relay which controls your turn signals, as well as a conversion module to make your rear turn signals function as additional brake lights and running lights! Perfect for ground up builds with no turn signal systems, or great as a replacement for your existing mechanical turn signal system and brake system! Please Note: The Penta-Star™ XP Module requires momentary push buttons to operate (not included). Latching-type switches, or push to cancel type switches, will not work properly because these types of switches send constant power to you turn signals when on and will defeat the main purpose of the self canceling feature. Mode 1 : Press turn signal button for 1 second, turn signal light will flash for 7 seconds, then self cancel. This mode is usually used when changing lanes. Mode 2 : Press turn signal button for 2 seconds, turn signal light will flash for 20 seconds, then self cancel. This mode is usually used when slowing down to go around a corner. Mode 3 : Press turn signal button for 4 seconds, turn signal light will flash for 75 seconds, then self cancel. This mode is usually used when stopping at a signal light and turn will be made after stopping. Note: All three modes above can be cancelled by pressing the same turn signal button a second time. Mode 4 : Hazard Mode - is available all the time and will flash until cancelled. To engage, depress both the left and right turn signal buttons for 1 second. To cancel, depress both buttons again for one second. Having a difficult time deciding which module best suits your needs? Take a look below to see the differences between them! What is the Self Canceling Turn Signal Module™? It is a electronic flashing relay that is meant to completely replace your existing mechanical flashing relay(s), or be a stand alone flashing relay to vehicles that do not have turn signals. It works with both LEDs or incandescent lights up to 10 amps per output. This module does not require any load equalizers because it is a self-timed electronic relay. Interested? View the complete product description! What is the Tri-Star™ XP Module? It is a electronic flashing relay that is meant to completely replace your existing mechanical flashing relay(s), or be a stand alone flashing relay to vehicles that do not have turn signals. It works with both LEDs or incandescent lights up to 10 amps per output. This module does not require any load equalizers because it is a self-timed electronic relay. Interested? View the complete product description! Signal Dynamics Corporation warranties this product at time of purchase to be free from defects in material and workmanship to the original purchaser. Signal Dynamics Corporation's obligation under the warranty is limited to repairing or exchanging the unit if the unit is returned with the postage prepaid to Signal Dynamics Corp. within 1 year from the date of purchase. The warranty is void if the unit has been incorrectly installed, damaged, or tampered with. This warranty specifically limits Signal Dynamics Corporation's liability to unit replacement only and specifically excludes any consequential damage arising from use proper or improper or failure to properly function. A copy of your purchase receipt or other proof of purchase is required when applying for warranty consideration. See full Warranty and Return Policy! The turn signal module failed on an 1999 Truckster I was working on. With limited information and OE parts I choose Penta-Star's XP module. Technical support was excellent and offered to return part as long as the harness wasn't cut if it didn't work in this application. It worked perfectly! Very happy with product. All prices are in USD Copyright 2019 Signal Dynamics.